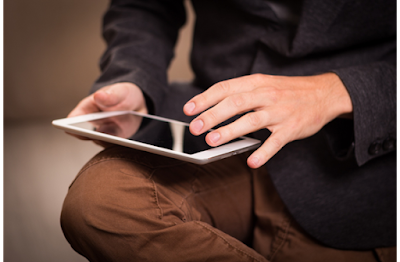 Please take this brief survey and tell us about your e-book experience. We want to make sure the library e-book and e-audiobook resources meet your needs. This survey is hosted by Westside Voices, an online panel that provides Washington County residents the opportunities to share their opinions on a variety of topics. WCCLS is sharing this survey with Clean Water Services so there are questions about water resources, too. The survey will only take a few minutes of your time, and your responses will help to improve your community. At the end of the survey you will have the option to join Westside Voices in order to receive future surveys on various topics. Thanks for sharing your thoughts with us! This survey is being hosted and administered by DHM Research, an independent research firm, to keep your personal information confidential. DHM assures complete confidentiality and anonymity of your information. 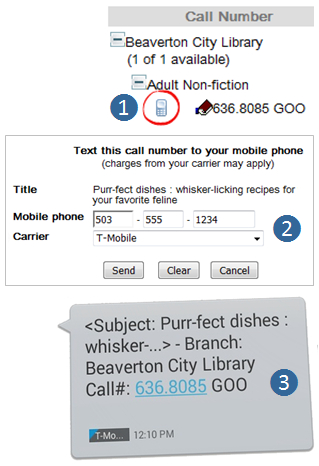 Meet the (pretty awesome) Catalog: Text it - new feature! You suddenly remember something important and you don’t want it to slip your mind, so you responsibly scribble a note for yourself. Then a few hours later, you remember you have a note, but when you look for it, you can’t find it! Now all you know is that you wanted to remember something… but what? The (pretty awesome) Catalog is here with a NEW feature that can help you remember and find titles at your local library. You’re browsing the MobilePAC at lunch and want to pop by the library on your way home to pick up a new DVD. Your child is doing a science project, and you need the call number so you can quickly run into the library and grab some books. Your friend tells you about an author that you want to look for the next time you’re at the library. You’re in the middle of a DIY project, and want to go to the library to browse that section for help instead of getting lost in a sea of internet videos. 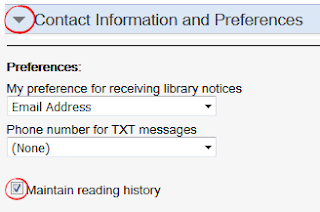 Enter your cell phone number, select your Carrier, and click Send. You must select the correct carrier for the text to be successful. Your text message will include the first 30 characters of the title, library name, and call number. Results vary slightly, depending on your phone and text messaging app. Note: This is the seventh of eight weekly tips about our online catalog. All WCCLS member libraries will be closed Monday, May 30, in observance of Memorial Day. 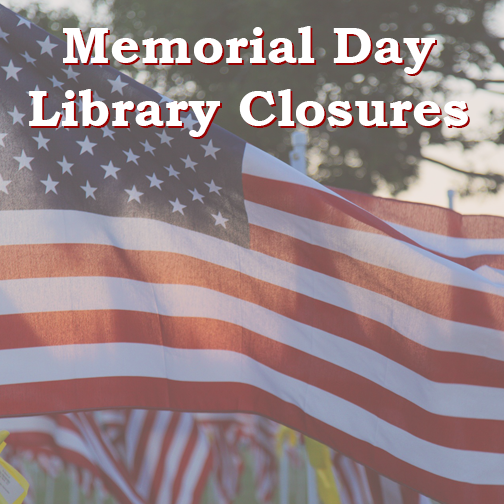 In addition to regular weekend closures, Forest Grove City Library will be closed Saturday, May 28, and Garden Home Community Library will be closed Tuesday, May 31 and Wednesday, June 1. All of our online resources and e-books are available! Have a safe and relaxing Memorial Day. Now that the Pink Panther music is semi-permanently stuck in your head, you will want to check out a Pink Panther movie for the weekend. 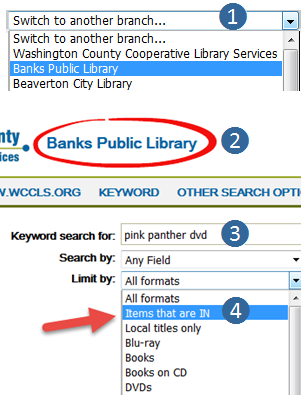 But you also want to make sure your library has at least one Pink Panther DVD before making the trek over there. How can you be sure? The (pretty awesome) Catalog is here to help you limit your search so that you’re only looking at items that are currently available. This can be helpful when you want to make sure the library has something checked in before you make the trip! Your child is doing a state report on Ohio, and needs a book ASAP. You want a book for the weekend, and you want to check ahead of time to see if there’s anything there by your favorite authors. You’re hosting a game night at your house, and you want to see what board games are available. You’re minutes away from finishing your audiobook, and you want to nab the next one in the series so you can start it right away. In the catalog, use the upper-right hand corner dropdown menu to switch to another branch. 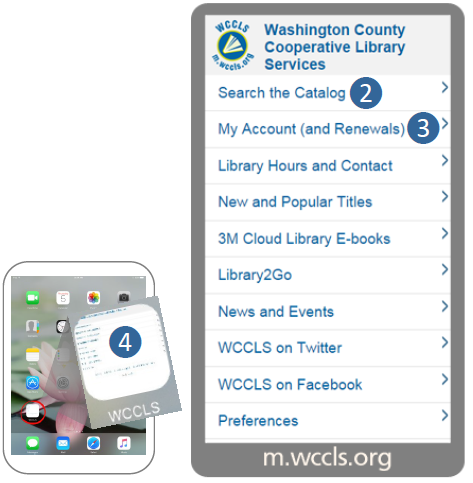 The location you’re searching now appears beside the WCCLS logo. Search for terms as you normally would. In the Limit by drop down, select Items that are IN. Your results will only show what is currently available! 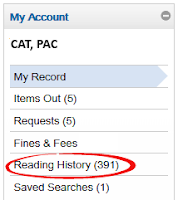 The Catalog has many other dropdown options and dashboard limiters that can help you. For more search tips, check out this two-minute video. Note: This is the sixth of eight weekly tips about our online catalog. Join Mike Stradley for a two-hour self defense seminar to explore safety strategies at work, with your family, and when you travel. Train the most important self defense tool you have, your brain. Develop a safety mind set. 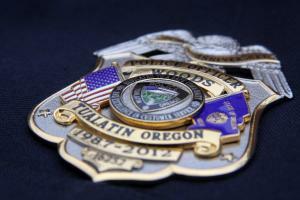 This class is presented by Mike Stradley, a police officer for over 31 years; currently working as a lieutenant in charge of patrol for the West Linn PD. “During my career I was on Portland’s Special Emergency Reaction Team for 18 years and a Pilot for the Bureau for 21 years, I was a Field Training Officer (Coach), Defensive Tactics Instructor, Crisis Intervention Team Officer, and Emotional Survival Instructor. “ Mike has also worked the Gang Enforcement Unit for six years and the Transit Division for three years. No registration is required for this free class. Meet the (pretty awesome) Catalog: Use the Catalog like an app! Imagine this: You’re out enjoying a rare, but much deserved free day, and suddenly this question hits you… “Are my library items overdue?” And then you can’t shake that thought, and your computer is miles away, so you can’t check your account online. But wait... you can! The (pretty awesome) Mobile Catalog is here to help. Visit m.wccls.org in the browser of your choice. Search the Catalog with a keyword or advanced search. Check your Account and renew titles. Make a shortcut on your device's home screen to keep the mobile catalog handy, like an app. Search the Internet for instructions on how to add a mobile shortcut to your device. 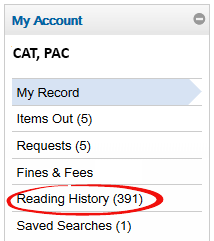 You can do most things you can do with the regular catalog in the MobilePAC, but if you’re ever stuck, simply click the Full Catalog link at the bottom. For more about the MobilePAC, check out this 1.5 minute video! 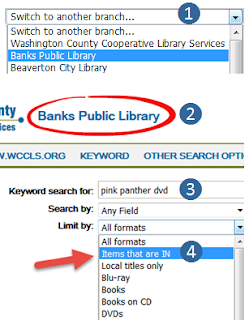 Note: This is the fifth of eight weekly tips about our online catalog. Due to network maintenance, all WCCLS websites will be down on Thursday, May 5, between 10:00 p.m. and midnight. We apologize for the inconvenience and thank you in advance for your patience!